The natural ageing process can make skin look dull and lifeless – skin characteristics that can make a person look much older than he or she actually is! 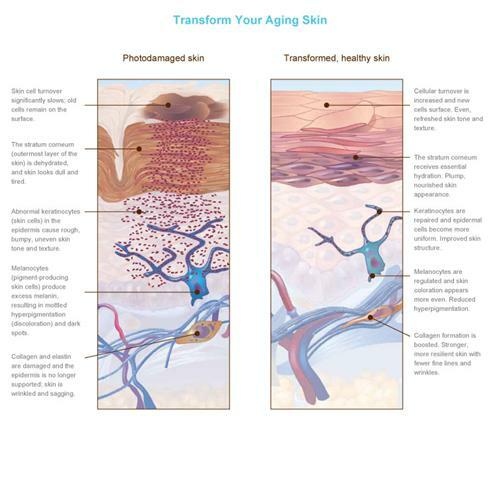 Without a powerful and effective anti-ageing skin care system – and with continued exposure to the sun, pollution, and stress – the skin will just deteriorate with the passage of time – and will continue to look older as the years go by. The Obagi Nu-Derm System has been formulated to combat the signs of skin ageing, and also to protect the skin from future or future damage. The Obagi Nu-Derm System corrects skin damage as it penetrates below the skin surface to make the improvements on the cellular level – making it possible for younger and healthier looking skin to be revealed again. Obagi Nu-Derm Foaming Gel – For Normal/Oily Skin – This gel-based cleanser effectively removes makeup, impurities, and oil – leaving even the oiliest skin clean and fresh. Obagi Nu-Derm Gentle Cleanser – For Normal/Dry Skin – This mild gel-based cleanser gently removes makeup, impurities, and oil – leaving the skin clean and fresh. Obagi Nu-Derm Toner – This toner adjusts the pH of the skin for increased penetration of the ingredients that are found in the other products in the Obagi Nu-Derm Anti-aging System. Obagi Nu-Derm Clear – This topical prescription treatment includes 4% hydroquinone to correct skin discolouration or hyperpigmentation, this product also works to even out and improve skin tone. Obagi Nu-Derm Exfoderm (For Normal/Dry Skin) – This is a plant acid (3% phytic acid) that successfully removes old skin cells while encouraging the production of new skin cells for a lighter, brighter complexion. Obagi Nu-Derm Exfoderm Forte (For Normal/Oily Skin) – This is an alpha-hydroxy acid (6% glycolic acid, 4% lactic acid) that effectively removes old skin cells while encouraging the production of new skin cells for a lighter, brighter, firmer complexion; this product is recommended for skin that needs deeper exfoliation. Obagi Nu-Derm Clear – This is a topical prescription treatment that includes 4% hydroquinone, used to correct skin discolouration or hyperpigmentation; this product also works to even out and improve skin tone. Obagi Nu-Derm Clear Fx™ – This is a topical non-prescription treatment which includes a non-hydroquinone skin brightener formulated with arbutin and antioxidants; this products works to even out and improve the appearance of skin tone. Obagi Nu-Derm Blender – This is a topical prescription treatment that contains 4% hydroquinone, targeting discoloured or hyperpigmented skin areas and increasing the penetration of the active ingredients of the Obagi Nu-Derm Anti-aging system. Obagi Nu-Derm Blend Fx™ – This is a topical non-prescription treatment with a non-hydroquinone skin brightener containing arbutin, exfoliants and antioxidants, which help clarify and brighten skin. Obagi Nu-Derm Healthy Skin Protection SPF 35 – This is a sunscreen product with 9% micronized zinc oxide and 7.5% octinoxate, which helps to protect newly transformed, younger-looking skin. Obagi Nu-Derm Sunfader SPF 15 – This is a topical prescription treatment that helps to protect skin from ultraviolet damage with 7.5% octinoxate and 5.5% oxybenzone, while working on correcting uneven surface skin color and brown spots with 4% hydroquinone. Obagi Nu-Derm Physical UV Block SPF 32 – This is a sunscreen product with 18.5% zinc oxide that helps to protect the newer, healthier skin created by skin transformation. Obagi Nu-Derm Sun Shield SPF 50 – This is a sunscreen product that combines high UVB absorption and dynamic UVA blockage in an elegant, matte finish with 10.5% zinc oxide and 7.5% octinoxate. This product does not have whitening effects, is PABA-free, and is fragrance-free for all skin types. Obagi Nu-Derm Eye Cream – This is a light moisturizing cream specially formulated to help control dryness around the sensitive eye area. Obagi Nu-Derm Tolereen – This product contains 0.5% hydrocortisone, and is used for the temporary relief of itching and burning associated with minor skin irritations. 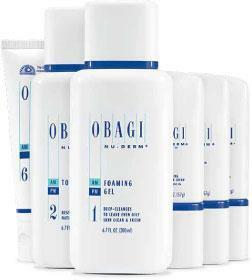 Obagi Nu-Derm Action – This is a moisturizing cream to be used as needed, to help soothe areas of dry, flaky skin.